Finding your photographic style is a process that takes time and passion. You need to practice as much as possible to hone your photography skills and make the camera do what you want, but practice alone is not enough. You also need to learn from others, and to have a clear vision of what you are trying to say with your images. To do this, you look within to discover what your message is, and without, to figure out which visual elements you want to use to express it. 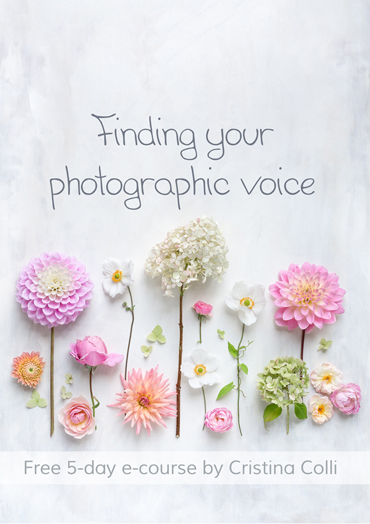 Finding your photographic voice is a 5-day free e-course that will help you speed the process up and help you find your voice a little bit faster, thanks to some simple steps that I’ll be sharing with you. Every day you will receive an email with practical guidelines and advice, and simple exercises to help you uncover your visual story, and find your photographic style. This e-course is part of the free resources available to my newsletter subscribers. Sign up to my newsletter Creative Notes below, and get access to my Inspiration Library and the free e-course. Are you ready to find your creative voice?